Until 30 June, Fairmont Singapore embarks on a major refurbishment program. Any noisy disruptions will be limited to between the hours of 10 a.m. and 6 p.m. Monday to Saturday excluding public holidays. 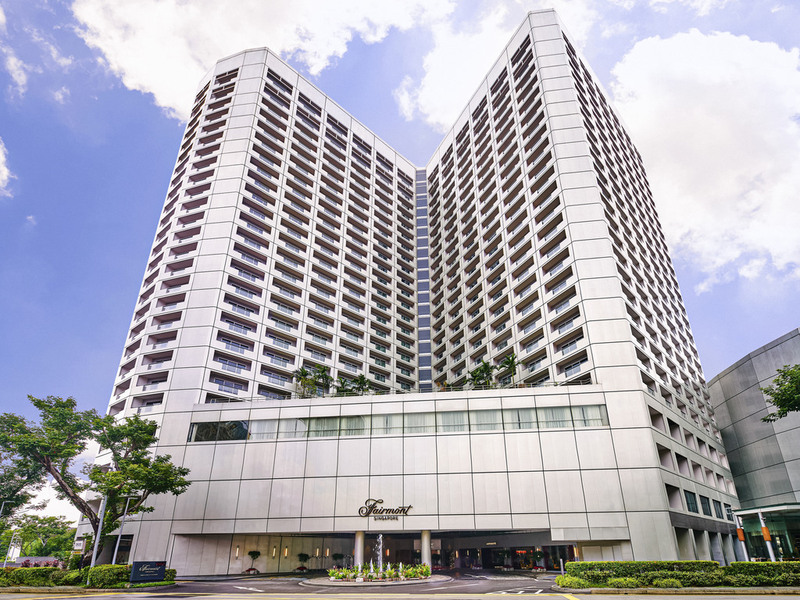 Fairmont Singapore is ideally situated at the crossroads of Singapore's business, cultural, entertainment and shopping districts, with the City Hall train station at its doorstep. There is no better way to enjoy this captivating city than to stay in the heart of it all with an offering of 769 luxurious guest rooms and suites, a collection of 13 distinctive restaurants and bars, 100,000 square feet of prime meeting space and award winning Willow Steam Spa. Prego is one of Singapore's favorite Italian restaurants that offer diners an authentic Italian family style dining experience. The theme of Prego is Italian Trattoria, expressed in every aspect of the restaurant. Featuring local favorites and contemporary regional delicacies, Asian Market Café offers a glorious buffet spread showcasing the breadth and depth of Halal-certified authentic pan-Asian cuisine. Mikuni offers a culinary tour through exquisite creations from its three stunning Teppanyaki, Sushi and Robatayaki live stations, each helmed by a master chef, that highlight the most premium of seasonal Japanese produce. An oasis of charm and elegance, the inimitable Szechuan Court & Kitchen is renowned for serving some of the finest Szechuan and Cantonese cuisine in Singapore. Accompany your meal with herbal tea or our famous eight treasures tea. The poolside Alligator Pear restaurant serves healthy and tasty meals, fresh fruits, juices and international favorites in a casual tropical setting. You can also sip artisanal cocktails against the perfect idyllic backdrop to unwind and relax. An oasis of charm and elegance, the inimitable Szechuan Court & Kitchen is renowned for serving some of the finest Szechuan and Cantonese cuisine in Singapore, like barbequed meats, dim sums & homemade noodles. Perched 71 floors above the buzzing city with an unobstructed view of Marina Bay area, Bar Rouge Singapore offers an intimate clubbing experience aimed at evoking one's visual, audio and aural senses. Anti:dote is a stylish and modern cocktail bar with a progressive selection of concoctions that appeals to the most discerning taste buds. Classic recipes are reinterpreted with contemporary flair and paired perfectly with innovative modern tapas. The Stamford Brasserie is an all-in-one dining destination that brings to life the charm and exuberance of a classic French brasserie. The stylish tri-concept outlet, is the first in the hotel to run completely plastic-free. Check-in was hassle-free without any delays. Upon arrival, was greeted with warm and hospitable welcome by the front-desk. Privileged to be at high floor with remarkable view. Despite the ongoing upgrading, not much of noise was heard during the point of stay. Room was adequate with good lightings, interior and basic amenities.A slight note to be taken of is the indication of shower facilities,An indicator to control the temperature of shower as it is in dual mode.Nevertheless,it is still bearable.Overall,a very pleasant stay at your property. I have a few concerns from my stay: 1. I was not made aware that the hotel was under major renovation when I booked. 2. This included continuous construction noise during our stay 3. We were told that no work work be underway on Sunday and yet there was construction throughout the day including early in the morning waking us us 4. I was charged for breakfast when I should not have been. it was my birthday and the hosts sent me a sweet card and cake to make me feel welcomed and truly appreciated the gift. made my day!!! Amazing . Friendly environment and loving. Very clean and neat. The rooms are clean every day nice smell in the area and good foods. I would definitely will come back. I think the staff is very kind to arrange for a room with bathtub for us. Very polite of the service crew. Breakfast is very delicious with a lot of varieties. Staff was very accommodating. Room was lovely. E had three nights in Singapore our usual stopover on the way to/from New Zealand. We always stay at the Fairmont as it meets all our needs, good location, very comfortable, excellent food and very friendly and efficient staff. Wouldn’t consider staying anywhere else. Due to renovation, the room balcony can't even accessed. Totally locked. We couldn't get a great picture of the view outside the room. Excellent hotel walking distance to main tourist draws at waterfront. Spacious, comfortable room, great service. very good hotel with better hospitality. Had a great staycation at Fairmont. Requested for both early check-in and late check-out & both was granted to me. Great hotel with satisfying services!! Hotel was nice, best location, one area to shopping mall and MRT station (city hall). Great service from the receptionist. I got free extra bed for 3 nights!! Check in taken lot of time and room service was pathetic, no one even receiving call for food order. Very satisfied with the room accommodation particularly with the bed, had a good sleep! Very courteous and helpful staff, clean room, nice facilities. And perfect location of the hotel, easy to go around the city. The room was located in front of the next building and relatively old facilities, no bath tub. Of course no upgrade the room, no club lounge access, no early check-in and no special. Room cleaning service were good. In terms of the cost vs quality, it was not so nice. Extremely enjoyable every one so courteous and obliging. I do not know how our experience could be made any better. Location is also very good. Disappointing on 25th stay in 10 y. Too much noise from building works Tripping over wires and tools on the way to pool. No additional welcome for a loyal guest.